It seems November is my month for challenges. I wrote earlier in the week about my participation in DigiWriMo. 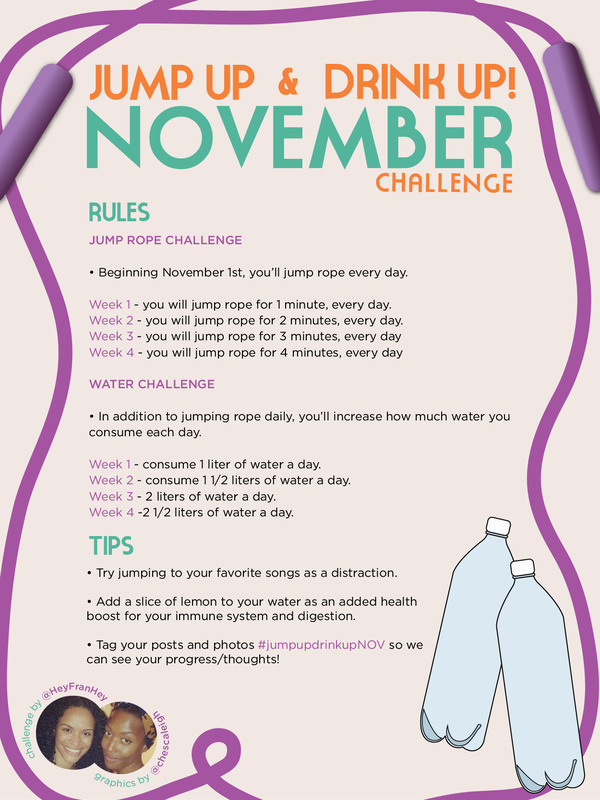 I'm also participating in Hey Fran Hey's Jump Up and Drink Up Challenge. One challenge is building my writing and creativity through writing more, the other challenge is building up a healthy body through cardio and drinking water. What have I gotten myself into?! lol I'll be sure to report back on how both challenges are going mid-month. Throughout the month of November you will also see a DigiWriMo word count on the bottom of each post. she is so much fun to watch on YouTube and she does have some great health tips! good luck to you on your challenge! Let me know if you need any suggestions for some good healthy recipes! I love her too! I'll definitely check in if I need some good recipes. I just bought a juicer so any juicing suggestions you have would be great!